With the holidays just barely behind us, wedding invitations have begun to go out, making special stops into our mailboxes. Now, while I'm entirely up for the excitement, my wallet, not so much. Yes, registries are great but unless you're buying the top tier item (ie: Keurigs, Kitchenaid mixers & food processors), you might be feeling like you're lacking in a few places. Thus the need for a little personalization without breaking the bank. 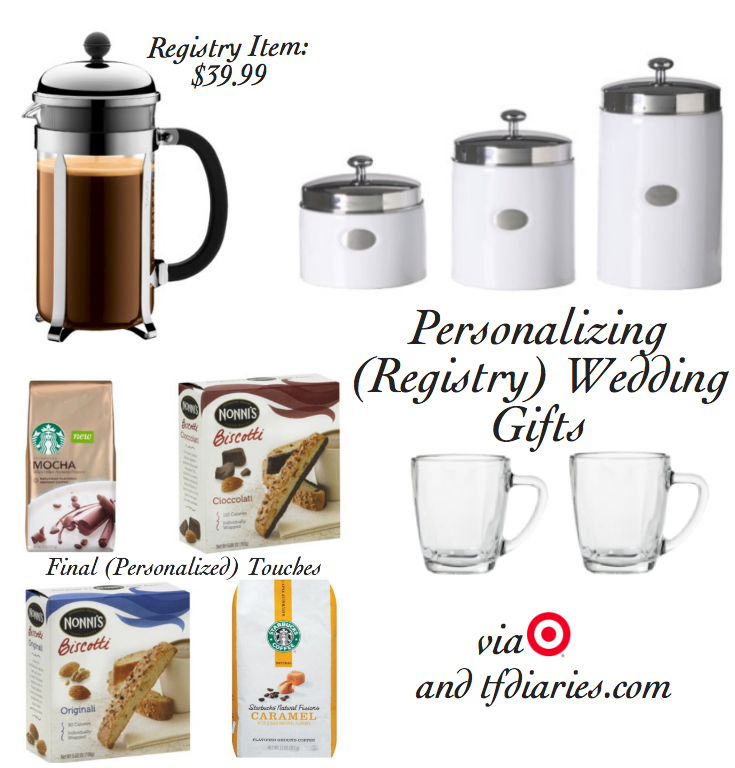 So, I teamed up with Target to create a personalized wedding gift right off one of my girlfriend's registry who's husband happens to love Coffee. Since they opted for a French Press (under $40), I grabbed a couple mugs and canisters to add a little something special to the gift. Now, since I know they love their Starbucks, I threw in a couple bags of the newest flavors and some biscotti for dipping. Arranged it in a pretty basket and it's an easy yet fun gift to give while staying true to the registry, and not breaking the bank. - Opt for practical items like Wine Glasses or Coffee Mugs. Adds Ons - their favorite wine or specialty coffees. Add Ons - Cute Muffin Liners & Homemade Mixes (cookies, brownies) in Jars. - You can even take a fun picture frame and attach it to the gift wrap as a gift tag. Play with ideas, and have fun! - And then there's engraving if you've run out of ideas. How do you personalize wedding gifts?